all of them ancient centers of the mountain ascetics (shugendoo　修験道). Hikosan is the second highest mountain in Fukuoka. Click for photos of the mountain.
. Hikosan　英彦山 / 彦山　Hikosan Shrines, Fukuoka and Oita .
. Buzenboo, Buzenbō 豊前坊 Buzenbo Tengu . Mount Hiko ("Hikosan" 英彦山 ) is a mountain located on the border between Fukuoka and Oita Prefectures. It is located about 60 km south of Kitakyushu city. This mountain is one of the three sacred mountains of Shugendo, along with Mount Haguro in Dewa-Sanzan and Mount Kinpu in Yoshino. In ancient Japan the mountains were worshipped as Shinto gods. From the 8th century, people started to enter the mountains to undergo training there, and in the 9-10th centuries, when it was influenced by esoteric Buddhism, the training started to be called shugendo. The priests of Shugendo lived in the mountain to train, and the priests in Hikosan trained some military arts, too. So the group of Hikosan's priests became a large army in the Middle Ages. But they were involved into the battle between the two Domains in Fukuoka Prefecture, then many of them were killed. Since that, Shugendo in Hikosan has declined. The height of Mount Hiko is 1,200 meters, and there is Hikosan Shrine on the western mountainside at the level of around 500 meters. The shrine has existed since the ancient times. At the foot of the mountain, there is "Kane-no-Torii" 銅の鳥居 made of bronze. It was built in 1637. It is designated as a national important cultural property. From here, the approach about 1 km long climbs the slope. At the end of the approach, there is "Hooheiden" shrine 奉幣殿. It was rebuilt in 1616. 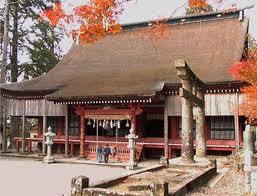 Originally, the building was the hall of a Buddhist temple for Shugendo priests. It is also designated as a national important cultural property. Near the top of Mount Hiko, there is Shogu shrine 上宮 at the level of 1,188 meters. It is the main shrine of Hikosan Shrine. They are a kind of clay bell (Hikosan dorei 英彦山土鈴), said to be the oldest ones used by the Shugendo ascetics. The believers in the Hikosan deity had many prayer groups in Kyushu (koo 講), each of which sent a representative to climb the mountain each year. Once he reached the main shrine at the top 英彦山神宮, he got this clay bell as proof to show his companions at home. He could also buy bells for each of the group members. There are five small bells in a bundle to be hung at the entrance of a home to ward off evil. Bigger bells could be hung at the kitchen entrance to ward off demons. They also ward off insects from the rice before harvest (gaichuu yoke　害虫除）when farmers hang them at the irrigation water entry of their rice fields or dig them in the ground there. More than 1300 years ago Emperor Monmu 文武天皇 made an offering of these bells to the shrine during a time of great drought, were they were kept as a special treasure. But about 800 years ago, during the civil wars, they were lost. So the lord of Hizen had a replica made as an offering to the shrine. This is the beginning of the Hikosan garagara, the oldest clay bells of Japan. 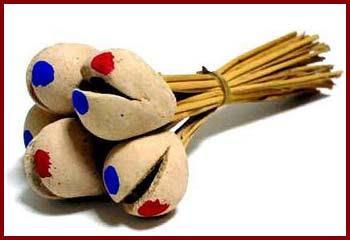 Nowadays they come in various sizes and types as local souvenirs, but the originals where of plain clay with a simple red and blue pattern. Some even had a tengu goblin mask on the bell. One fish is about 7,5 cm long. The word TAI is related to MEDETAIめでたい, an auspicious occasion.
. Iwai tai, iwaidai 祝い鯛、祝鯛 tai sea bream for festivities . When they are shaken, they make a loud noise to ward off evil influence. Beliefs and practices associated with Mt Hiko, in the southern part of Fukuoka Prefecture, Kyushu. Hiko is made up of three peaks: Minamidake, Nakadake, and Kitadake, the highest of which is Minamidake at 1200 m.
Formerly "Hiko" was written with the characters 日子, meaning "child of the sun"; in the first half of the ninth century, during the reign of the Emperor Saga, it was changed to the single character 彦, and then again to 英彦, its present designation, in 1729, at the order of the Retired Emperor Reigen. 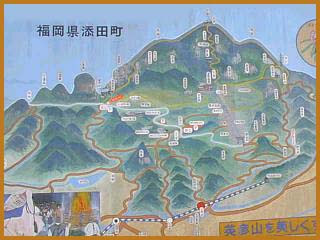 According to the Kamakura-period Hikosan ruki, the Gongen of the Three Places of Mt Hiko (Hikosan sansho gongen) was composed of Mt Zokutai in the south (Shaka), Mt Hottai in the north (Amida) and Mt Nyotai in the center (Thousand-armed Kannon). 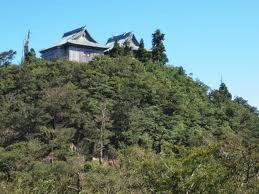 The present shrine Hikosan Jingū Honsha (the jōgū, or "upper shrine") is located on the central peak and amalgamates the enshrined deities (saijin) of the other two peaks. Formerly there were nine other sacred sites: Mt. Hakusan, Daigyōji, Kitayamadono, Hannya Cave (Tamaya), Ōminami Cave, Buzen Cave, Chimuro Cave, Takanosu Cave, and the middle shrine (chūgū). Added to the Gongen of the Three Places, they were worshipped as the Gongen of the Twelve Places (Hikosan jūnisho gongen). Altogether there were 49 caves, sites of veneration and religious training, which were considered to correspond to the 49 halls of the Tushita heaven, the dwelling-place of Maitreya. Each was said to have contained statues of the Gongen of the Three Places or protector deities, but today the only ones which remain sites of veneration are the Hannya, Ōminami, Buzen and Chimuro caves. The caves can be thought to preserve an aspect of religious practice which was prominent in the medieval period, that of retreat (komori) inside caves, before the introduction of mountain asceticism in the form of moving from one sacred place to another (tosō). Seasonal mountain entry rituals (junbu in spring, hanaku no mine in summer and gyakubu in autumn) took form during the Muromachi period. Here, Mt Hiko was considered to be the realm of the Womb Mandala, while the role of Diamond Mandala was fulfilled by Mt Hōman in spring and Mt Fukuchi in autumn. Forty-eight places of ascetic training (gyōba) were established over a sixty kilometer route through the mountains, and the goal of training was represented as the unity of the two mandalas. Most of the sites fell into disuse after the discontinuation of mountain-entry rituals in 1870. According to founding legends, Ame no Oshihomimi, アメノオシホミミ son of Amaterasu, descended to this mountain and was enshrined here, En no Ozunu, with his mother on his back, climbed Mt Hiko and then went to China by way of Mt Hōman, and Jugen, having trained at Ōmine, brought the divided spirit of Kumano Gongen here. Another legend says that Zenshō, a priest from the state of Northern Wei in China, brought a Buddhist statue to Hiko and taught a hunter called Fujiwara Kōyū about the precept of not taking life by means of a miraculous occurrence whereby he restored to life, as a white hawk, a white deer the hunter had pursued and shot. In 538 Zenshō built a hermitage called Reisen on the mountain, and Kōyū, having taken the Buddhist name Ninniku, became his successor. The third priest in the lineage, Hōren, went to Kyoto at the order of the Emperor Saga; at this time the characters to write Hiko were changed (see above) and the hermitage was given the temple name of Reisenji. It also received a land commendation ("seven ri in the four directions"), which it kept throughout the medieval period. Hiko later thrived as a center for yamabushi; at its height it had 3800 priests, and, with Ōmine and Haguro, it was counted as one of the three great Shugendō sites of Japan. In 1333, the imperial prince Yasuhito (said to have been a son of the Emperor Go-Fushimi) was invited to the temple as its head (zasu), and the shrine-temple complex on the mountain was organized under a hereditary married head, made up of priests (shūtō), kami priests (jinin) and shugen priests. 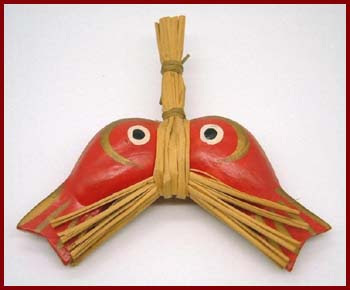 Shugendō rituals and organization became fixed during the Muromachi period. Of particular importance were doctrinal developments, in which Hiko played a leading role. A comprehensive compilation of records was made by Akyūbō Sokuden (dates unknown), who had come to Hiko from Nikkō. In the Edo period, Hiko was not under the authority of either Honzanha or Tōzanha, but maintained its independence from them. However in 1696, as a result of a dispute with Shōgoin (head temple of Honzanha), Hiko was designated a "special headquarters Shugen temple of Tendai" (Tendai Shugen bekkaku honzan). Its economic base was an income of 1200 koku donated by the Hosokawa and Ogasawara clans, plus the distribution of talismans and medicines among supporters (danna) throughout Kyushu, as well as the promotion of pilgrimage (sankei) to Hiko. By the end of the Edo period, it had 250 shugen priests and around 420,000 households in its parishes. The organization of the yamabushi was threefold – gyōjakata, shūtōkata, and sōkata, with lower-ranking shugen priests below them. All were under the authority of the zasu. As a result of the separation of buddha and kami worship (shinbutsu bunri) and anti-Buddhist actions (haibutsu kishaku), virtually all buildings associated with Shugendō were lost, with the exception of the former Great Hall, which was converted into the shrine's Buheiden. Shugendō ritual was also abolished. The shrine-temple complex known as Hikosan Gongen became Hikosan Shrine, the Buzenbō became Takanushi Shrine, and Hannyakutsu became Tamaya Shrine. The zasu became the hereditary gūji. The shrine supported devotees of the confraternities (kō), drawn mainly from farming families. 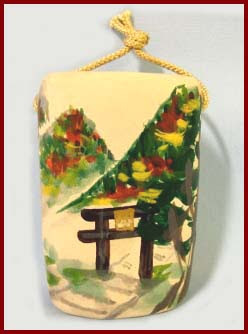 The clay bell, a famous souvenir of Mt Hiko, is still used as a magical implement for agricultural rituals among farmers. 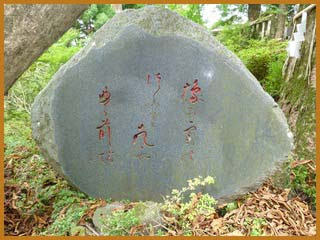 There is a large chestnut tree near this memorial stone.
. Sugita Hisajo 杉田久女 . Hisajo liked the area and even climbed to the peak of the mountain. Buzenbo is a shrine hall on the north-east side of Mount Hiko.
. Regional Folk Toys from Fukuoka .
. Shugendo and Yamabushi 修験道、山伏 Mountain Ascets .